Aromas Del Perú was quite an intriguing place. I say that because even if the surroundings are quite cozy and welcoming, they are not exactly upscale, the decor can even be described as on the shabby-rustic-chic side. The food that arrives at the table though, with a luxurious amount of seafood, does leave you stunned; the aromas and colors simply captivating. 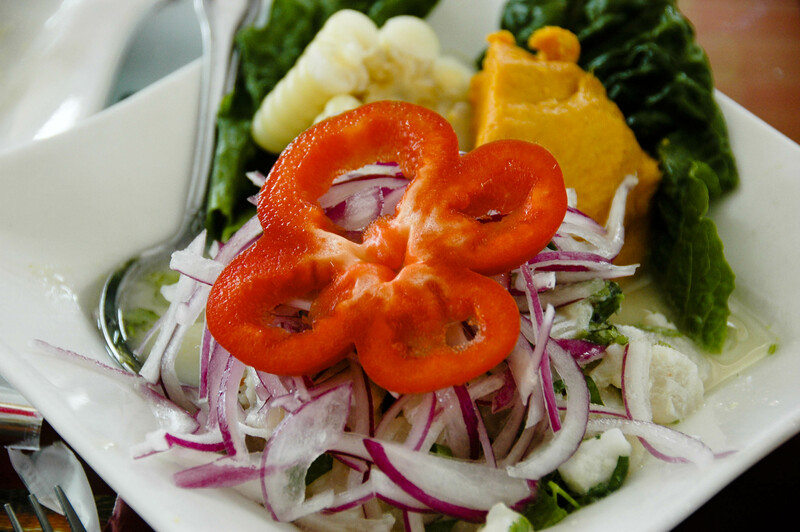 We had the Ceviche de Pescado – a dish of small, raw chunks of fish seasoned and marinated in citrus juice. It was served with Peruvian Corn (choclo) and sweet potatoes. The marinated fish was bathed with red onions and cilantro, and the taste was fresh and vibrant. There was a peculiar addition to this plate which was the big slice of red pepper, not a usual part of a Peruvian ceviche. I think they put the pepper on top because they saw that I was taking pictures and they wanted to add some more red color to the plate. Can’t blame them, it was a brilliant idea, even if the fish was buried under the pepper and onions. 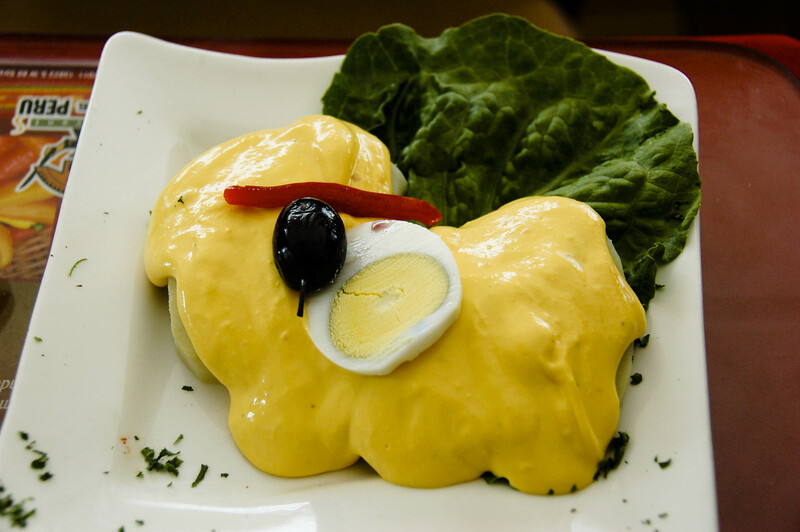 Papa a La Huancaina was our next taste, which were baked potatoes covered with a mild creamy, slightly-spicy cheese sauce garnished with a thin slice of boiled egg, a sliver of red pepper and a shiny black olive; comfort food at its best. 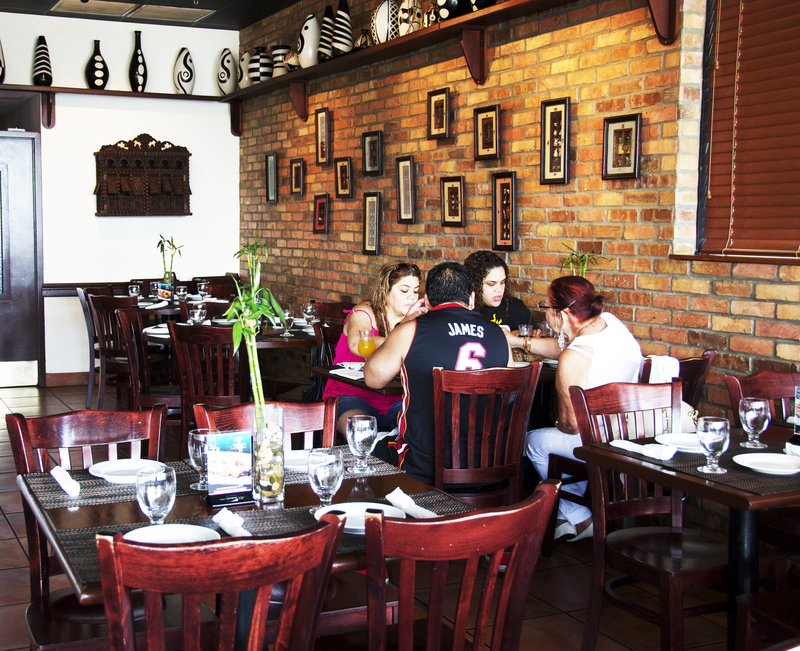 Choros a la Chalaca was made with mussels served with onion and tomatoes, marinated in lime juice. The mussels were delicious but the dish was over-garnished. In addition to the tomatoes and onions, there were also two different types of corn and all that stuff masked the flavor of the mussels. At first glance, you cannot even see the mussels at all. 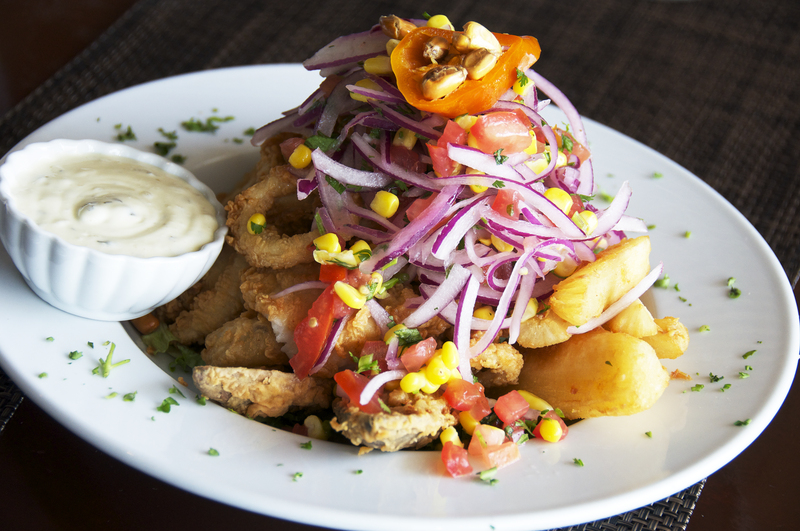 Jalea is got to be one of my favorite dishes at Aromas Del Perú. It was a mountain of fried seafood served with cassava and a delicate onion sauce. This delight included calamari, mussels, chunky pieces of grouper and shrimps. 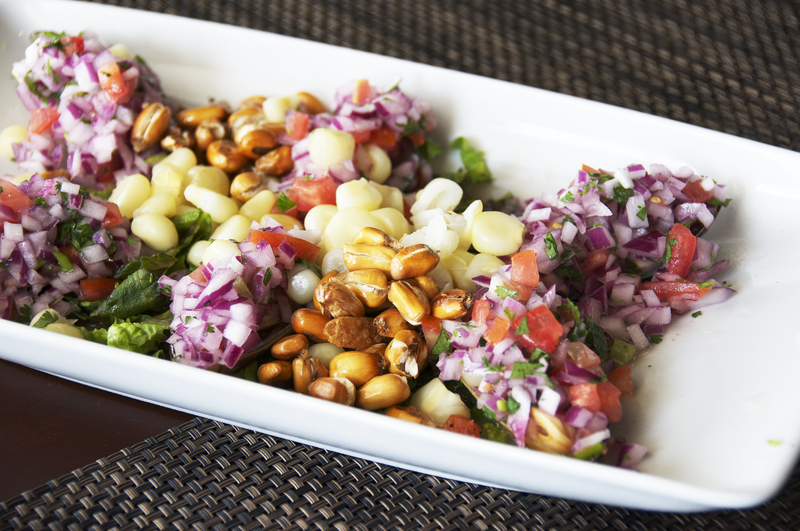 The sauce consisted of red onions, corn, cilantro, lime juice and a touch of tomatoes. Fried food can be heavy, but not in this case: the batter was pleasing, golden and light. 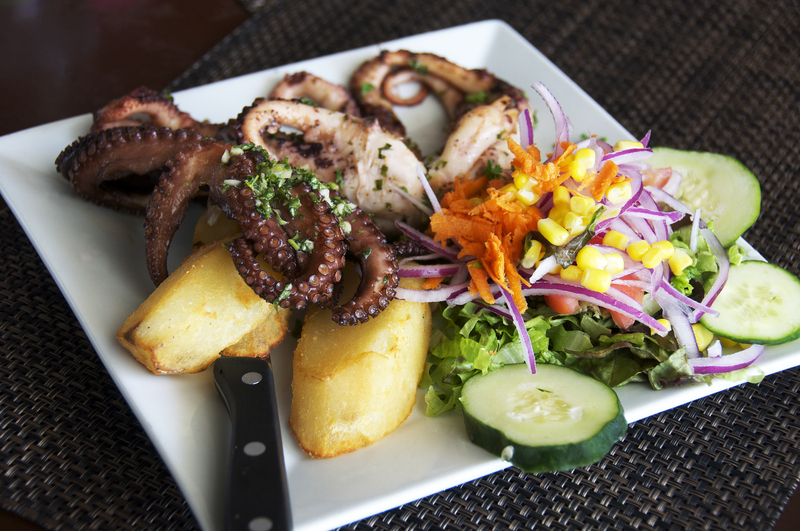 Pulpo a la Parilla was a small whole octopus served with a salad made with corn, carrots, cucumbers and red onions. 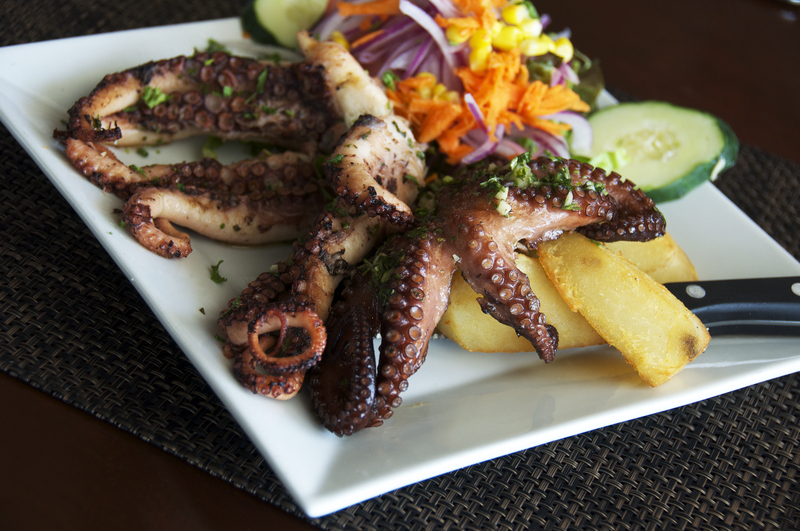 The world turned upside down after one taste of the octopus: it was chewy-soft, smoky and drizzled with a sauce made with cilantro, garlic and oil. The flavor was so robust that is almost tasted like meat, according to my daughter. It was a dish fit for a King or Queen except for one thing: the beak was still inside the octopus and that was just creepy. 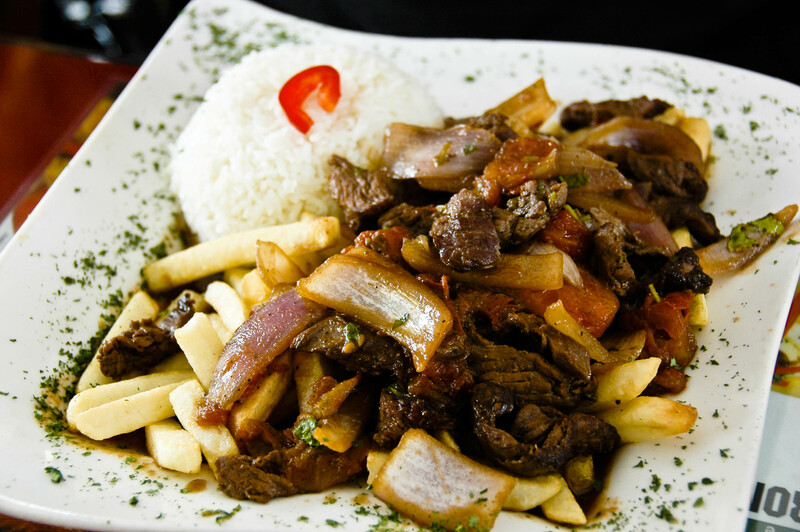 Lomo Saltado is another typically Peruvian dish that still baffles me. 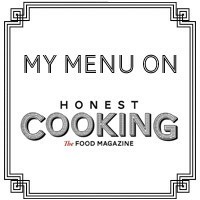 It is basically beef strips sautéed with onions and tomatoes and served with rice and French fries. The first time I saw this dish I asked myself: What are the fries doing all mixed up with the gravy and the beef? Who would want to eat wet French fries? I was frankly a little hesitant to try it but my bravery paid off as mixing the fries with everything else is pure genius. This dish was filling, exotic and everyday at the same time. 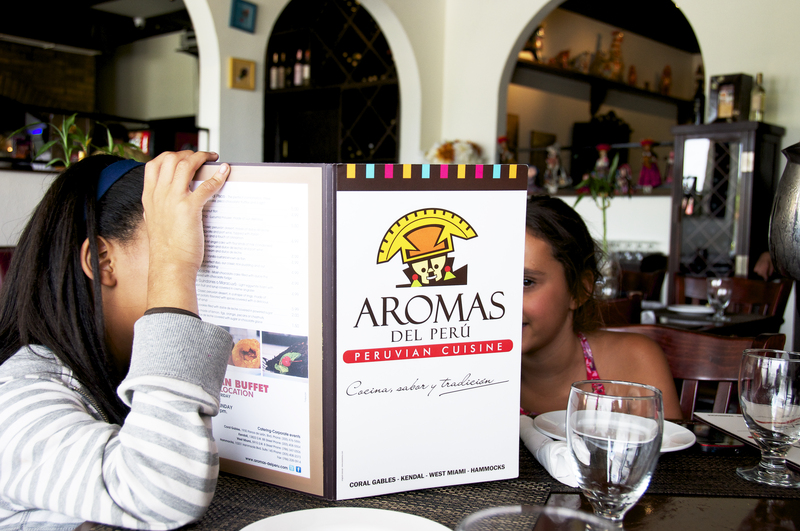 Aromas Del Perú is definitely worth a visit. 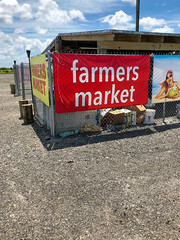 They are four locations in Miami and the one in The Hammocks is the closest to us. 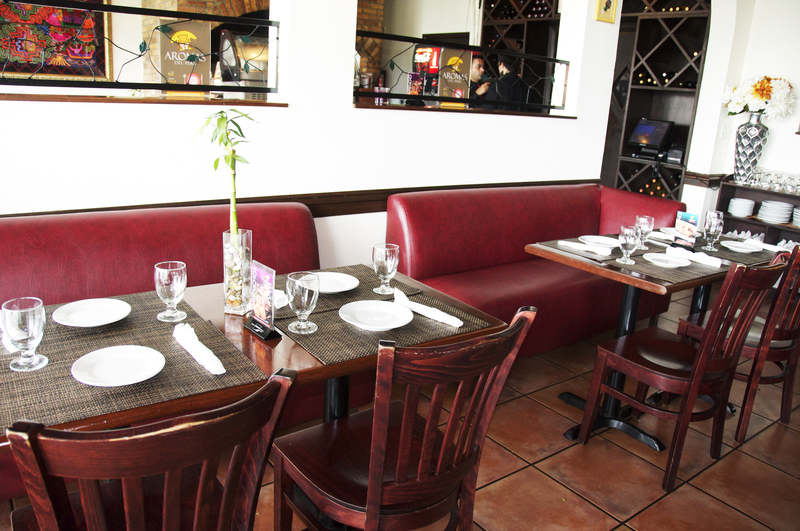 It is family-friendly and can be a tad loud at times but to me that means that it is a pleasant place to gather with friends and loved ones to savor great food.